In India women wear saree on their daily basis as their native clothing and identity at home, casually or formally but that doesn’t leave an impression that only Indians wear Sarees. Sarees are an inspirational dress among ladies of many areas, may not be casually but Eastern women prefer wearing it on occasions like family functions, parties, weddings, etc. Many designers, fashion platforms all around the globe have incorporated their own interpretations in designing sarees other than India only like there is a hint of modernity & pattern variations, color schemes, styling in sarees at Western side. Customers there in Western countries appreciate traditional clothing & like to wear them on various occasions. A huge variety of this dress is now being presented by famous fashion designers according to the demand of young ladies. Here we are posting the Latest Indian Party Wear Fancy Sarees Designs Collection. From place to place & country to country, depending on the prevalent fashions and cultures of the certain area. 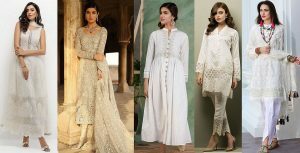 Designers always keep their different touch among designs & dressing like Pakistani & Indian fashion is similar somewhat but not exactly or the same. But when it comes to Sarees, the designs and trends will be seen same among all. Pakistani culture doesn’t support saree wear on a daily basis yet over the last few years it has become quite refined in terms of fashion. Saree is a dress that helps to depict the true colors of traditions and to define the feminine beauty n the more furnished way. Especially at functions like parties, weddings, etc. a good fancy one helps you look more adorable and gorgeous fulfilling all aspects of beauty. Initially, ladies of medium or old age preferred this dress, but now young girls are seen in this pretty couture at many events, no matter married or unmarried. By the time, of course, there happened many changes in designs & cuts, rather than old fashioned sarees there are many other designs and trends available in the market like in the old times, banarsi ones were preferable or tissue or else but this modern fashion has left no limits of fabrics from chiffon to net, silk to organza, cotton to georgette and some others. 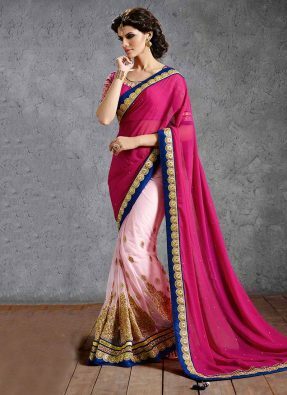 Party wear sarees are usually made in chiffon, net or thin silk in approximately all colors like black, pink, green, blue, white, skin, peach, violet, red, silver, gold and many more. For the night parties, black or silver is the most stunning contrast but there is no limit of choice what suits you better. Different categories are available in blouse either half, full or sleeveless all depending on customer’s choice. Here below in the gallery, you will see the variety of modern saree designs, colors, and trends according to latest fashion these days. 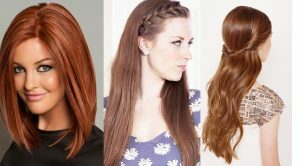 You can buy these from online stores or the brands nearby. If you are from Pakistan, America, Bangladesh, UK or any other country you can get these sarees at your doorstep by ordering the required item. Hope you will love these & if you do, consider mentioning it in the comment sector below. Saree is always a right choice towards any party. You can go for simple you love light embroideries. Depending upon the function, you can choose the saree. Like the heavy embellished one for a wedding party, a simple light adorned for a get-together. A bold colored for a sangeet night, a traditional red for an anniversary, etc. You can go for a net blouse, silk, georgette, chiffon, organza, etc. 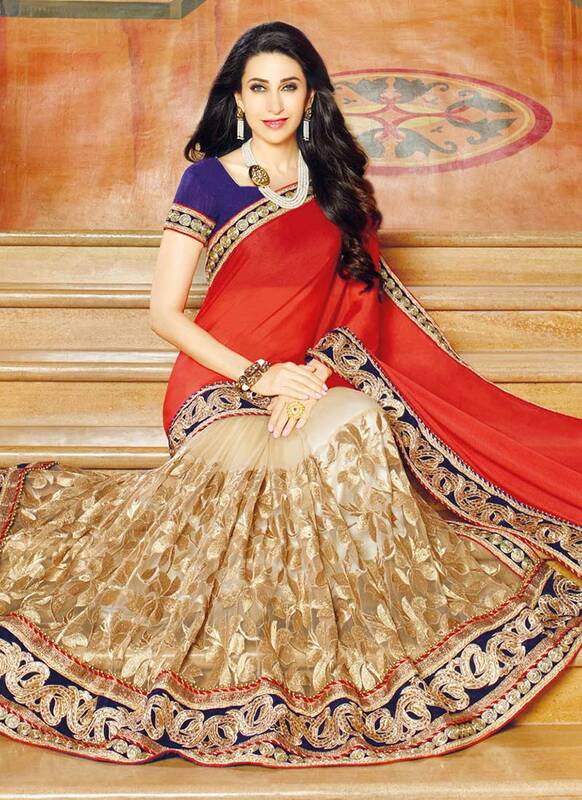 Just add a lace detailing, on the whole, the pallu and borders towards a plain saree can give it a sophisticated look. Wear a statement necklace on the plain raw silk sari will give you a gorgeous appearance. For more grace pair it with the stunning heels. You can also add tassels, latkans, pearls, beads, crystals, etc on the neckline or pallu. 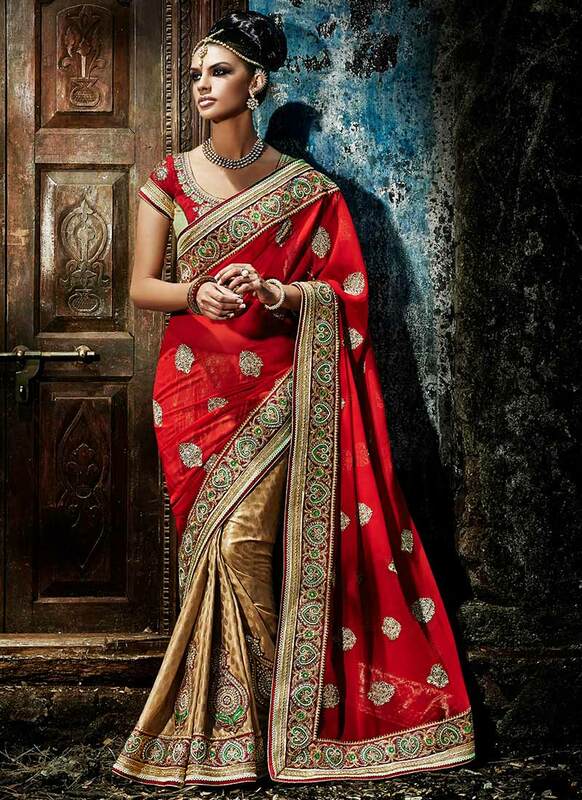 Indian sarees are loved and adorned all over the world. They have their own grace and charm other than depicting the traditions. Indian women wear them on a daily basis while the ones living abroad not getting time still love to wear them on their national days and festivals. Here we are presenting some of the latest designs. I hope this will help you in finding and selecting the right saree for the right occasion.